18K Solid Gold Dog head Ring. Personalized: Ruby Emerald Sapphire Diamonds. Made to order Fine Jewellery. Dog Lover Jewel. Statement Ring. A unique delicate handmade jewel for dog lovers. The design was fully made by a special animal lover and rescuer Cordelia Lichtensteiger from Brittany, France. It is fully handmade by the most skillful hands in Greece. The product is classy and extremely delicate and elegant. The material that is used is 18K Solid Yellow Gold. On each side of the there are three little natural Diamonds. You can consider having it with a single Emerald, Ruby, Sapphire, Moissanite or a Brilliant cut natural Diamond. If a natural Diamond is your choice, you would have to contact us since the final price alters. 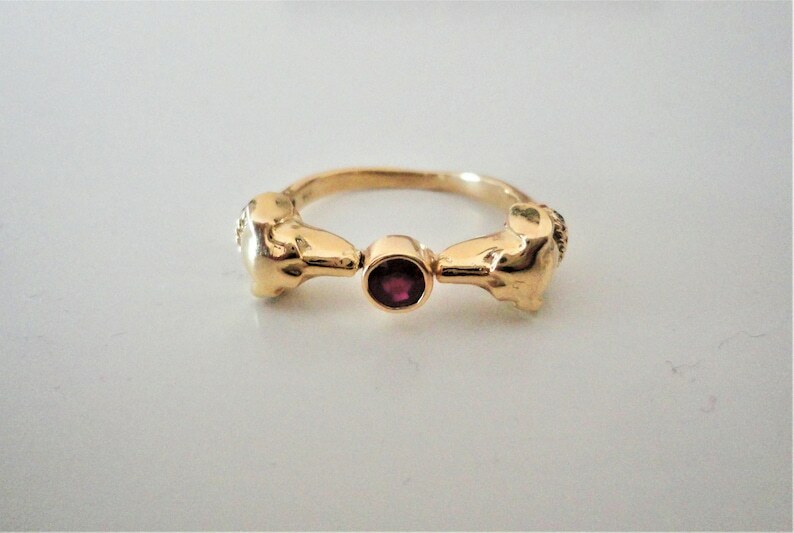 The pictures illustrate the original ring made for Cordelia Lichtenstreiger with a top quality faceted ruby stone, made after sending us her designs on paper. A lot of emphasis has been put on details and techniques that serve better in order to have the best and most delicate object. Cordelia wanted to combine in this piece harmony and symmetry in accordance to her love for dogs. The design has techniques that derive from ancient Greek jewels. For instance, the twisted wires are used in this case around the necks in order to give the idea that the dogs have a collar. The diamonds on the collar are attached with the ancient technique of the 'granulation' instead of having a bezel. On the whole, the techniques used for this production derive from antiquity and have passed from from one generation of craftsmen to the other. 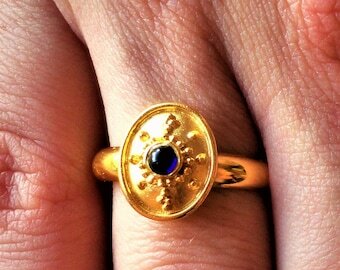 Lastly, the elegance of the dog heads make this ring to be for special people that love our little friends! As a company we consider the amount to be spent for this item quite high, especially when it comes for an executive jewel through the internet. Therefore, we always send with the item a full quality guarantee. In this paper important information/legal guarantee is given to the customer signed be the legal owner of the company. The paper gives a full description of the final product, details upon the metal that was used, quality guarantee for precious and semi-precious stones -if there are to be used any-, the final price that you paid, and photos of your final product. In various countries this paper can be used legally for a plethora of reasons such as using the jewel as an asset or for insurance companies. Please select between the stones we offer as well as your size. We work individually on every piece. Thus, we can discuss the quality of the stones and the small details that will make this item just for you. Precious stones as well as natural and lab grown diamonds in all cuts and carats are available for this ring, though you will have to contact us to discuss these options. If you are interested in any further customization, please contact me. Between the time of your payment and shipment, we always keep our customers posted upon the progress. Two or three emails will let you know what has been done at that time and how much time we estimate that we need until shipment. Finally, before shipping the item to you, photos from different angles and a video will be sent to you in order to confirm if you are fully satisfied. We are confident enough to say that we can recreate or redesign any archaic jewel, or any really a 100% handmade item, you may desire. The only thing you have to do is to send us photos from different angles and you can get an estimate. In addition, we are more than sure that our 30 year experience is going to secure for you the best and most unique natural stones. 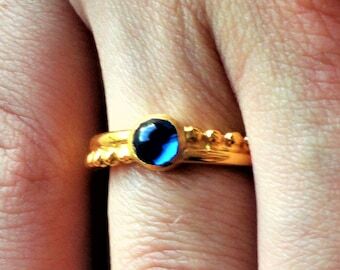 18K 22K Solid Gold Ring. Personalized: Ruby Emerald Sapphire Diamond. 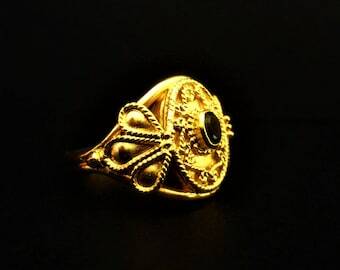 Ancient Greek - Roman - Byzantine Jewel. 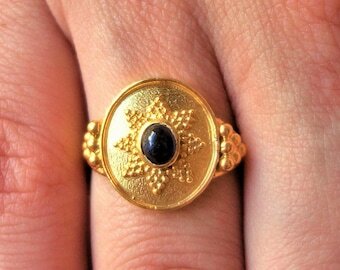 Rosette Ring. Statement Ring. 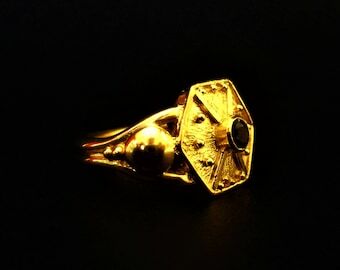 18K 22K Solid Gold Ring. Personalized - Ruby Emerald Sapphire. Granulation. Ancient Greek Roman Byzantine Jewellery. 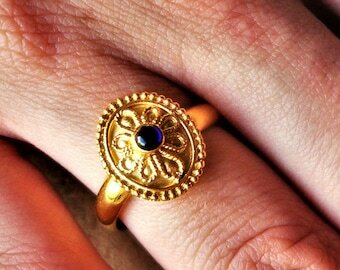 Archaic Grecian Jewel. 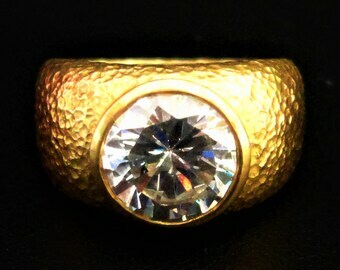 18K 22K Solid Gold Ring. Ancient Greek Roman Byzantine Jewellery. 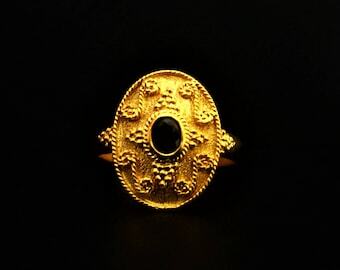 Archaic Grecian Jewel. Personalized - Ruby Emerald Sapphire. Granulation.